Sleeps 4, 1 bedroom w queen bed & sofa bed w slipcover in living room. Many renters with allergies & respiratory issues have rented because of these renovations (newer central AC has a Hepa filter) and we book-up early every summer since 2006! We have always been a PET-FREE & NON-SMOKING PROPERTY for those with respiratory and allergy issues. We are family friendly with 2 children of our own. It's a short 1/2 mile walk to 3 of the 6 public Bass River beaches using the newer public sidewalks! If you are not familiar with the Bass River, South Yarmouth area we are centrally located 1 1/2 hours to either Boston or Provincetown (the furthest tip of Cape Cod). We have many local amenities (4 mini-golf's, BonkerZ, plus batting cage with driving range, and over 1/2 dozen ice cream businesses to sample!) near us in Bass River plus 6 public beaches within a mile plus several GREAT Golf courses, Grocery Stores, Hyannis Mall (for those rainy days), the New Whydah Pirate Museum that celebrated the 300th anniversary of the Whydah in 2018, The Inflatable Park with its NEW Water Park that opened in 2018, whale watch boat trips, ferries to Nantucket or Martha's Vineyard and our Cape Cod Rail Trails has continued to grow each year with several new bike bridges completed, plus so much more! Please go online and Google 'Yarmouth MA." to see all the different things you can do here on Cape Cod! SORRY BUT WE ONLY RENT WEEKLY DURING PEAK-SEASON. Sept. dates are a 2 night minimum. Renters are responsible to bring all linens. Linen's are available to rent for $50 for the week. PLEASE JUST LET US KNOW IF YOU NEED LINENS AND WE’LL ADD THEM TO YOU INVOICE BEFORE PAYMENT. Linen’s includes monogrammed cottage hand/bath towels, beach towels and 2019 Organic sheets & pillow cases along with a mid-week laundering if requested. We provide pillows, down comforter and quilt. ONLINE BOOKING FEES FOR ALL ONLINE PAYMENTS VARY BY COUNTRY (WE HAVE ABSORBED THESE FOR YEARS, THE FEES ARE $29-$50 TOTAL FOR EACH RENTAL TRANSACTION PAYMENT DEPENDING WHERE YOU ARE BOOKING FROM) AND ARE CHARGED TO US AFTER EACH PAYMENT, WE WILL PAY THESE FROM THE $50 ADMINISTRATION FEE YOU'LL SEE ON THE INVOICE..
We bought back in 2005, live on-site and have spent each year improving our property and the 2 cottage rentals. It's a great property and we are proud to offer you a renovated & clean place to enjoy your vacation. We love living in Bass River and the short walk to the beaches with our 2 children whom have grown up as our little beach-bums! LOL We offer an open invitation Saturday nights to our fire pit after check-in to anyone that doesn't have plans & looking to relax and laugh…our kids(15 & 16 yrs) are usually around with their friends and the more the merrier! (weather permitting) Regina & I sell real estate year-round here on the Cape so feel free to ask us any questions if you've been thinking about real estate and investing for your future here on the Cape. Look around and if you can find a better deal as clean and newly renovated as ours go for it…we are confident that we are offering you the best in a 1 bedroom cottage vacation rental in Bass River! Newer bathroom with full tub! 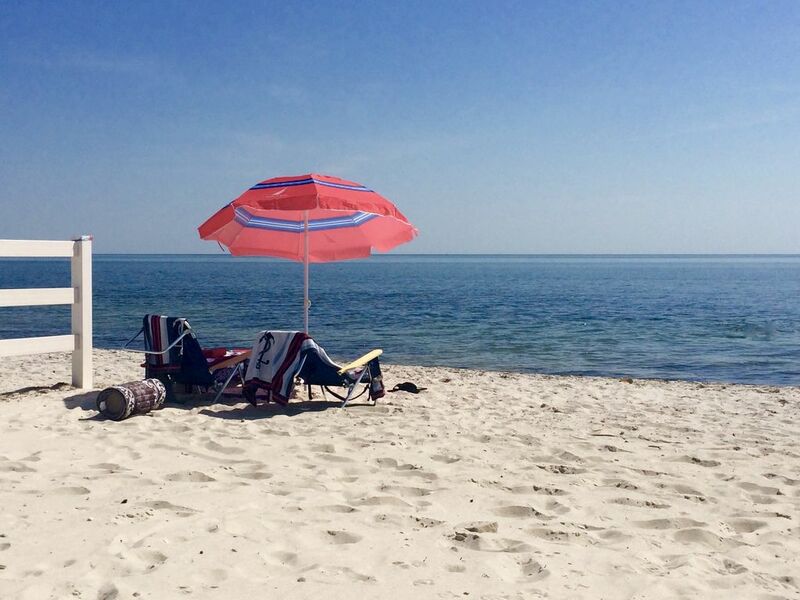 The village of Bass River in South Yarmouth has 6 beaches on Nantucket Sound with beautiful Cape Cod sandy beaches! We are just 1/2 mile walk using the sidewalk to 3 Bass River/Nantucket Sound beaches! Renters are responsible to bring ALL linens. Linen's are able to rent for $50 a week. That includes "Gray Piper" cottage monogrammed bath/hand towels, & beach towels plus 2019 Organic sheet set. 2 parking places where you can park one in front of the other. Wireless WiFi with Orbi Whole Home Mesh System to maximize internet speed for streaming. We supply everything we think you'll need! Let us know if we missed something! 2019 Digital Samsung Smart TV for streaming your internet subscriptions. We will be using YouTube TV for the 2019 rental season with Xfinity wireless WiFi with Orbi Whole Home Mesh System to maximize internet speed for streaming.YouTube TV receives Red Sox games. Directly behind Cottage B is available as a shared backyard for your use. We had a wonderful long weekend - the house was meticulously clean with thoughtful ancillary items not all home owners make available for guests. Thank you for a stress free stay! My daughter and I spent 3 nights at the cottage. everything was new , clean and all the comforts of home. Owners very nice and we will recommend to friends and family. My wife and I stayed here for a week with our 5 year old daughter and had a great time. The cottage is immaculate, with a full kitchen, full bathroom, living room and bedroom. It's a short distance to great family beaches, one of which includes a playground that our daughter enjoyed. There are restaurants near by, along with activities like miniature golf. There's a whale watching company in Barnstable, which is about 20 minutes away. We took ferries to Martha's Vineyard and Nantucket; the ferries out of Hyannis are a 15-20 minute ride from the house. Jim & Regina are very accommodating and they were there to meet us when we checked in. We highly recommend this property. I was looking for a beach getaway for myself and my daughter to celebrate her recent college graduation. We were both impressed with the cottage, as it was comfortable, cute, clean, and had extra touches throughout. The air conditioning was key on muggy days.We enjoyed walking to the beach for morning coffee. We ventured out a few days to explore other beaches in the surrounding areas but we would have been fine staying in the general vicinity. The owners live on site but we hardly saw them. The cottage, especially with the back patio, felt quite private. They were quick to respond to any questions I had. Jim was helpful in recommending buying lobster at the local grocery store where they can steam it for you to avoid the hassle of cooking. Great idea!! The grocery store is a quick 3 minute drive up the street. Our vacation was exactly what I was hoping for. 10 minute walk to the beach, 3 minute drive to lots of restaurants and activities but far enough down a secondary road so it's quiet and calm. If you are not familiar with the Bass River area it's a village of South Yarmouth and the most sort after area in Yarmouth area for its beaches. Located between Bass River and Parkers River with 6 public beaches to pick from, it's a short .5 mile walk using the sidewalks to 3 of those public ocean beaches and just a bit further to the others. We are centrally located 1 1/2 hours to either Boston or Provincetown (the furthest tip of Cape Cod). We have many amenities around us starting with the 6 public beaches plus several mini golf, Cape Cod Mall (for those rainy days), Whale watch boat trips, Fast ferries to Nantucket or Martha's Vineyard, and the new Inflatable & Water Park plus The Whydah Pirate Museum and so much more! Renters are responsible to bring all linens. Linen's are able to rent for $50 a week. Just let us know a few days prior to check-in. That includes "Gray Piper" monogramed cottage towels from Bloomingdale's, plus beach towels, 2019 Organic sheets & pillow cases. We provide new pillows at the beginning of each rental season and down comforter and/or quilt. ONLINE BOOKING FEES FOR ALL ONLINE PAYMENTS VARY BY COUNTRY ( $25-$50 TOTAL FEES FOR ALL PAYMENTS) AND ARE SENT TO US AFTER EACH PAYMENT, WE DEDUCT THOSE CHARGES FROM THE $50 ADMINISTRATION FEE.